What a fun topic for some and what a not so fun topic for others. If you like snakes or not there is surely some interesting things to learn about them when visiting the tropics. 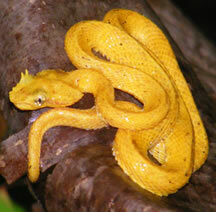 They are actually very fascinating animals and with the number of species of snakes in Costa Rica which is around 135. Fortunately for the visiting hiker most of these are harmless. There are a few that can be deadly. There are 17 poisonous vipers (many non venomous snakes try to look like vipers but the real way to tell is the four holes on the nose where non venomous only have two) and 4 poisonous coral snakes (there are 11 false non-venomous corals; The 4 venomous have rings all the way around and the 11 false corals only have rings 3/4 of the way around. The rings do not connect on their bellies). You have to understand though that ALL SPECIES do not want to bite you. There is also one species of sea-snake that is poisonous that there is no anti-venom for but it's last recorded bite was in 1960. There are stories out there about how some species will come out and get you but it is not true. If you are hiking, just watch where you step, easy when you grab a tree limb, and just relax. There are two types of poisonous venoms in Costa Rica and one comes from the vipers which is called hemotoxin which affects the blood and muscles. The other comes from the corals which is called neurotoxin which affects the brain. Here in Costa Rica there are around 600 snake bites every year and only 3 - 6 of those bites end up being fatal. That is a low number of snake bites if you think of all the agriculture workers along with all the eco-tourist that travel through Costa Rica every year. One of the reasons for such a low fatality rate of these bites is thanks to the the Law #13 in 1926 which is the "Law of Protection of Ophidism" and the works of Clodomiro Picado who was a Costa Rican scientist from 1887-1944 which is a accredited of being one of the first to discover snake anti-venoms. There is now anti-venom for snakes in every hospital in Costa Rica. It is good to know that only 3-6 people have died in Costa Rica by snake bites yearly unlike India where the number of fatalities due to snake bites is around 35000 to 50000 yearly. Really great post, but snakes are actually venomous not poisonous.